Product categories of Compact Spinning System, we are specialized manufacturers from China, Compact Spinning System, Compact Spinning Machine suppliers/factory, wholesale high-quality products of Compact Conversion Kit R & D and manufacturing, we have the perfect after-sales service and technical support. Look forward to your cooperation! 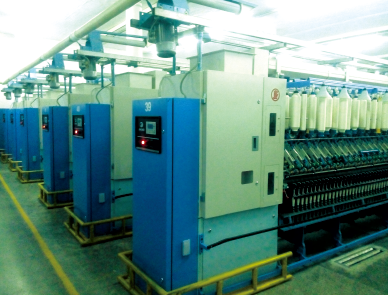 Compact Spinning System is installated for ring frame. And it can improve yarn quality and yarn speed. In order to meet the requirement of yarn with low hairiness and high strength, the compact spinning device with independent intellectual property rights has the following characteristics: superior maneuverability, flexibility and economy. The system of supplying pressure with optimized design: the high-pressure air blower with independent and changeable frequency conversion controls and with special design of flue and blast pipe can guarantee the negative pressure of the sucker mouth in the tailstock and locomotive of the machines within the range of best technological requirement. The negative pressure tunnel will be arranged in draft district to make the route of pipeline as short as possible and the wind will be exhausted through wind system in tailstock so that it can eliminate the interference of air flow in the workshop and the working environment also can be improved. Users can change it to be an ordinary ring Spinning Machine easily according to the needs of production in a short time without the slightest impact on the quality of yarn, which is the RFCS compact spinning system to production cost control from the user`s point of view. Besides compact spinning conversion, our company also provide Seamless Machine, Circular Knitting Machine, Twisting Machine, Assembly Winder Machine, looms and so on.